In one of my recent ETHNIKKA african expeditions, I came across an infusion beverage that, cold, allowed us to resist the tropical heat. It was red, it was soft, and it was delicious. In West Africa (Senegal, Guinea Bissau, Mali, Burkina Faso, Ghana, Benin, Togo and Niger) it’s known with the name of bissap. I thought it was a local beverage limited only to this area, so I was stunned when on my last ETHNIKKA travel to Mexico, I found that the much acclaimed and drunk Agua de Jamaica tasted similar and was prepared in the same manner using the same ingredients. Investigating further in the internet I saw that roselle, with which the two beverages are produced, could be one of the most extended crops in the world. In Australia is known as rosella, on the Indian subcontinent as meshta, tengamora in Assam, gongura in Telugu, lalchatni or kutrum in Mithila, mathipuli in Kerala, chin baung in Burma, กระเจี๊ยบ (krajeab) in Thailand, dah or dah bleni in other parts of Mali, wonjo in the Gambia, zobo in western Nigeria -the Yorubas in Nigeria call the white variety Isapa (pronounced Ishapa)-, zoborodo in Northern Nigeria, chaye-torosh in Iran, كركديه (karkadé) in Egypt, Saudi Arabia, and Sudan, omutete in Namibia, sorrel in the Caribbean and in Latin America, flor de Jamaica in Mexico, saril in Panama, rosela in Indonesia, asam paya or asam susur in Malaysia, 洛神花 (Luo Shen Hua) in China, and in Zambia, is known by the name of lumanda by the cibemba, katolo by the kikaonde and wusi by the chilunda. 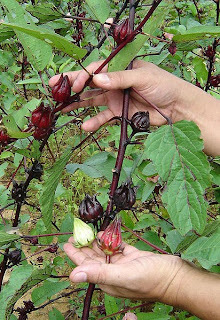 The roselle (Hibiscus sabdariffa) is a species of Hibiscus native to African tropics. It is an annual or perennial herb or woody-based subshrub, growing to 2–2.5 m tall. The leaves are deeply three- to five-lobed, 8–15 cm long, arranged alternately on the stems. The flowers are 8–10 cm in diameter, white to pale yellow with a dark red spot at the base of each petal, and have a stout fleshy calyx at the base, 1–2 cm wide, enlarging to 3–3.5 cm, fleshy and bright red as the fruit matures (it takes about six months to mature). The plant is considered to have antihypertensive properties. Primarily, the plant is cultivated for the production for bast fibre from the stem of the plant. The fibre may be used as a substitute for jute in making burlap. Hibiscus, specifically Roselle, has been used in folk medicine as a diuretic, mild laxative, and treatment for cardiac and nerve diseases and cancer. 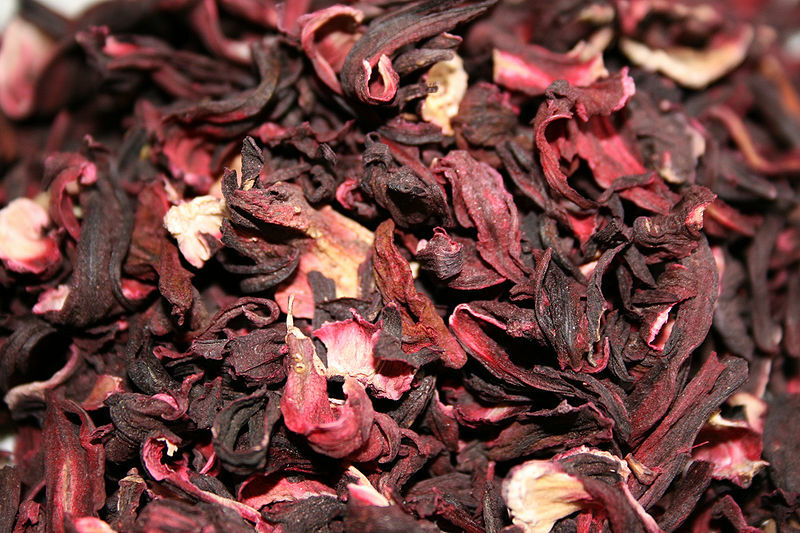 In the Caribbean (Jamaica and Trinidad and Tobago), sorrel drink is made from sepals of the roselle. 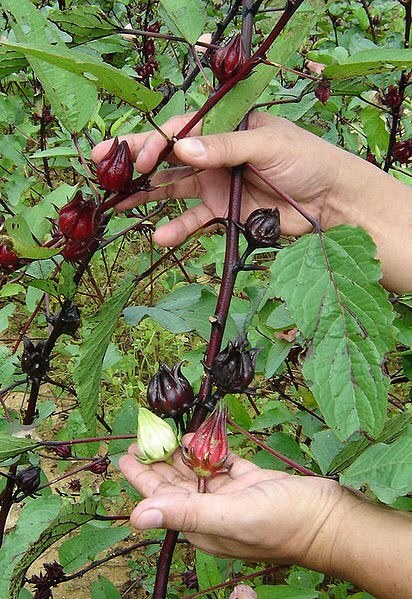 In Malaysia, roselle calyces are harvested fresh to produce pro-health drink due to high contents of vitamin C and anthocyanins. In Mexico, 'agua de Flor de Jamaica' (water flavoured with roselle) frequently called "agua de Jamaica" is most often homemade. Also, since many untrained consumers mistake the calyces of the plant to be dried flowers, it is widely, but erroneously, believed that the drink is made from the flowers of the non-existent "Jamaica plant". It is prepared by boiling dried calyces of Hibiscus in water for 8 to 10 minutes (or until the water turns red), then adding sugar. It is usually served chilled. In Jamaica ginger and rum is usually added at Christmas time, and in Trinidad & Tobago the ginger is substituted for cinnamon and cloves for added flavour. In Mali, Senegal, The Gambia, Burkina Faso and Benin calyces are used to prepare cold, sweet drinks popular in social events, often mixed with mint leaves, dissolved menthol candy, and/or various fruit flavours.